Join the Mizzou Alumni Association and the campus community in welcoming the class of 2019 to the Mizzou family. 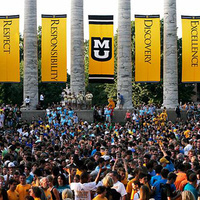 Freshmen will walk through the Columns signifying their entrance into the university, followed by a reception complete with Tiger Stripe ice cream and a performance by Marching Mizzou and the Spirit Squad. Watch Tiger Walk live on Livestream.